The smell of lamb roasting on outdoor BBQ spits … streets filled with choirs, bands and religious processions … and clay pots falling from the sky. 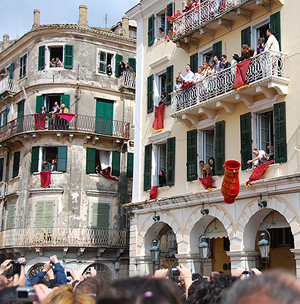 These are the sounds and sights of Orthodox Easter on the Greek island of Corfu. Every April, hundreds of Corfiots return to their homeland to participate in the biggest celebration of the year. During Holy Week here, Ecclesiastical hymns creep out from churches all over the town. Good Friday is a sombre affair with philharmonic choirs and orchestras from every village passing through the crowded streets of Kirkyra (Corfu Town). 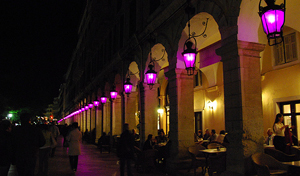 Purple banners signifying sorrow are draped from balconies and the lamps hanging in the portico of Liston, a popular outdoor terrace, are dimmed with a purple glow. 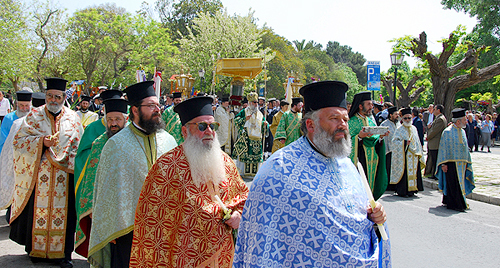 Priests in colorful, regal vestments from every diocese on the island lead the procession of St. Spiridon, the patron saint of Corfu. Young children join in by strewing flowers in the paths of the mourners carrying Epitaphs symbolizing the tomb of Christ. All day, prayers are muttered to the sad ringing of bells. On Friday night, Corfu Island resonates with music. A candlelight procession is accompanied by several choirs and bands. Then, after 10pm, friends and families, Greek and tourist alike, gather in cafes and restaurants for dinner and dancing to bouzouki music until the small hours of the morning. Saturday is not to be missed. Crowds gather in the main plaza near Liston to witness the throwing of the pots, an old tradition dating back to the Venetians in the 16th century who used to throw all their old and useless objects and pots out of their windows. The crash of breaking clay delivers a loud message that death has been beaten by the Resurrection of Christ. Cheerful red banners of life replace the sorrowful purple ones. Take in the sights and sounds, but beware: when the bell tolls at noon, dozens of pots — some as large as a small child — fall from the sky. Thousands cheer when each water-filled pot crashes to the ground below … woe to the cleanup crews who must come later! Immediately after, the crowd surges en masse to the parade route to hear the triumphant music of praise. At midnight, the crowd congregates in Spianada Square for a Greek Orthodox Service celebrating the Resurrection of Christ. When the bells strike midnight, light believed to be from the Cave of Birth in Bethlehem is given to all people who hold white candles symbolizing the joyful occasion of the risen Christ. A wondrous display of fireworks over the water marks the end of the day. Those who manage to wake early on Sunday go to mass. The men in each family rise at dawn to prepare the coals and begin roasting the lambs. Everyone participates during the day in turning the spit, and, of course, sampling the meat to test its readiness. Huge tables are set up outdoors, laden with traditional foods like chilihourda (the local Easter soup), fogatsa (Easter bread), columbines, red eggs, tzatziki, wine and ouzo. More music fills the air, with guitar playing, singing, drinking and eating all afternoon until, one by one, the guests, full and tired, wander home. The beautiful green island of Corfu lies in the crystal blue waters of the Ionian Sea between Italy and Greece. It can be reached by plane and by ferry from both countries.